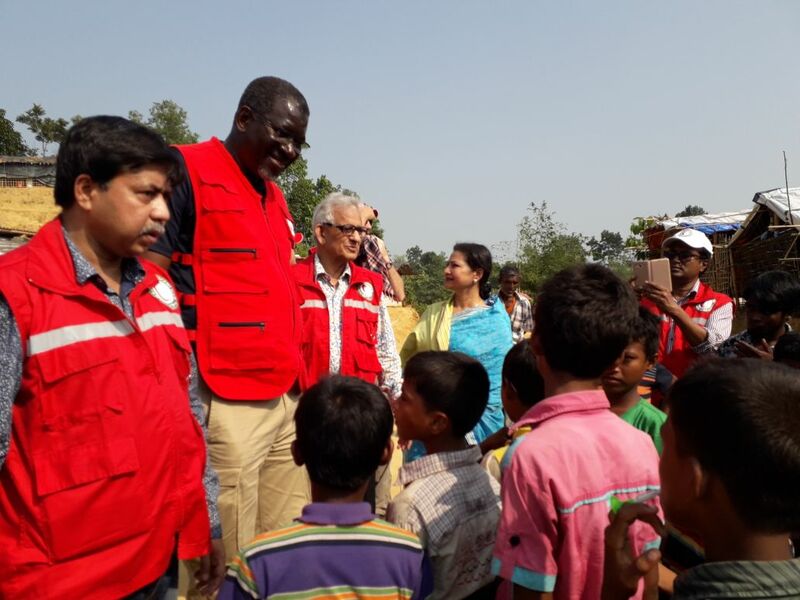 Chairman, Bangladesh Red Crescent Society Mr. Hafiz Ahmed Mazumdar and Elhadj As Sy, Secretary General of International Federation of Red Cross and Red Crescent Societies (IFRC) visit Cox’s Bazar, Tambru Border today. They meet with the people and children fled from Myanmer now living in Tambru Border areas. At that time Prof. Dr. Md. Habibe Millat, MP, Honorable Vice Chairman of Bangladesh Red Crescent Society, Tresurar of BDRCS Advocate Toushidur Rahman, BMM Mozharul Huq, ndc, Secreery General, BDRCS and Azmat Ulla, HoCO of IFRC, Bangladesh were also present in the occasion. Along with the Chairman BDRCS and Secretarey General, Internation Federation, IFRC, a group of high officials from IFRC and ICRC visit the Tambru border.